Senate Majority Leader Scott Fitzgerald (R-Juneau) discussed the state budget on WKOW’s Capitol City Sunday with Greg Neumann this week. Fitzgerald was asked how his caucus will prioritize any additional revenue after revised estimates are announced next week. He said the estimates are likely to be lower than hoped and the first priority is K-12 education, followed by the state’s transportation needs. When asked about Governor Scott Walker’s proposed $300 million budget cut to UW System, Fitzgerald said he had less of a commitment to decrease the cut after the Board of Regents approved tuition increases on out-of-state and professional students earlier this month. Despite the unpopularity of the proposed cut — one poll found seventy percent of the state opposed — Fitzgerald told Neumann that some legislators still have a bitter taste in their mouths after the budget surplus issue of the last biennium. The Joint Finance Committee has met three times in recent weeks to vote on motions related to the 2015-17 biennial budget (Senate Bill 21). Committee Co-chair Representative John Nygren (R-Marinette) said Wednesday he did not expect to meet next week, as the committee waits on revised revenue estimates due in early May. Legislative leaders have previously said they would direct additional revenue, if available, toward K-12 education, transportation needs, and the University of Wisconsin System. However, recent statements by Governor Walker and Senate Majority Leader Scott Fitzgerald indicate revenue estimates may come in lower than hoped, leaving little extra funding for the university. PROFS continues to meet with legislators, including members of the Joint Finance Committee, advocating for the best possible budget for UW-Madison faculty. Chancellor Rebecca Blank offers her view on public research universities and their role in Tuesday’s Milwaukee Journal Sentinel. “The importance of research universities in educating top scientists, engineers and doctors is well understood. But the second part of our mission is equally important and often forgotten or misconstrued. Those who criticize our faculty for not teaching enough fail to recognize that teaching is only half their work. Blank acknowledges that funding for research has slowed in recent years, with potentially devastating consequences as other nations increase their research funding. Senate Majority Leader Scott Fitzgerald (R-Juneau) and Senate Minority Leader Jennifer Schilling (D-La Crosse) appeared on UpFront with Mike Gousha on April 12 and agreed on little, including Governor Scott Walker’s proposed $300 million cut to the University of Wisconsin System. Fitzgerald said he believes the quality of a University of Wisconsin education will not suffer as a result of budget cuts — “I think they will be fine in the end” — while Schilling maintained the proposed cuts have already adversely affected campuses around the state, citing already-announced buyouts at five campuses. Schilling also said time to degree could increase as a result of the cuts. Discussion about UW System begins at the 3:45 minute mark. Walker also said he intends to limit tuition increases to no more than the annual change in the Consumer Price Index (CPI) after a two-year freeze, saying the move would protect students and parent from unpredictable tuition increases. The governor also said he would not change statutory language regarding the university’s mission, thus keeping the Wisconsin Idea intact. The spring general election will be held Tuesday, April 7. Polls are open statewide from 7 am until 8 pm. More information on registration and voting in Wisconsin is here. Photo identification is not required to vote in this election, but will be required to vote in future elections. One statewide race is on the ballot — incumbent Wisconsin Supreme Court Justice Ann Walsh Bradley faces challenger Rock County Circuit Court Judge James Daley. 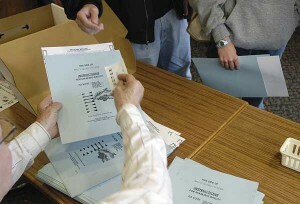 Voters will also be asked to vote in a referendum on the election of the Wisconsin Supreme Court Chief Justice. Currently, the longest-serving justice is chief justice. The proposed amendment would select a chief justice through an election by the majority of the Court. The elected chief justice would serve a two-year term. There is one state legislative race on the ballot — former Representative Duey Stroebel (R-Saukville) faces token write-in opposition to represent the 20th Senate District (Cedarburg, Port Washington, West Bend). The seat became vacant when State Senator Glenn Grothman was elected to Congress last November. Voters in Madison will choose between incumbent Paul Soglin and challenger Scott Resnick, both graduates of UW-Madison, for mayor. The University of Wisconsin-Madison Office of Federal Relations will host an event featuring former Congressmen David Obey and Thomas Petri at 3:30 pm Monday, April 13 in Tripp Commons in the Memorial Union, 800 Langdon Street. Together, Obey, the longest-serving Wisconsin member of Congress, and Petri served in Congress for almost 80 years. The Wisconsin Institute for Public Policy and Service, the David R. Obey Civic Resource Center, the Wisconsin Humanities Council/Working Lives Project, UW-Madison Department of Political Science, the Robert M. La Follette School of Public Affairs, and the Elections Research Center are event partners.